Isometric images have lots of uses, from architectural drawings, logo designs, game graphics and of course isometric art. 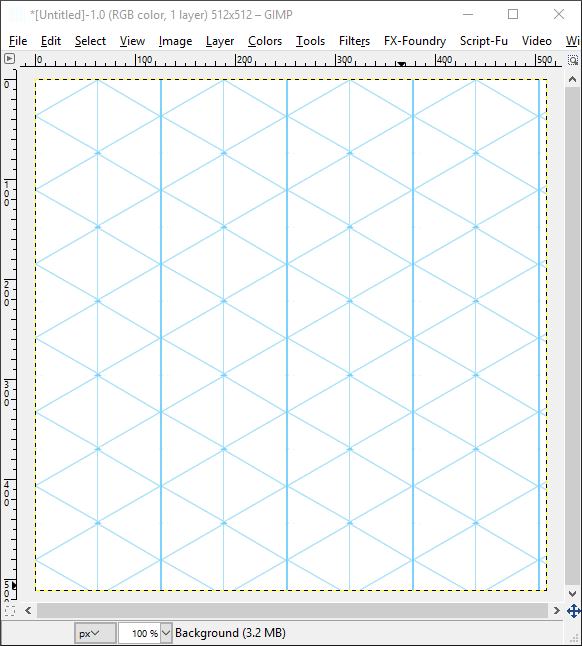 Whilst Gimp is a tremendous tool for any visual artist, one of its drawbacks is it doesn't have an isometric grid. However, this tutorial will show you how to work around that and then how to create a basic isometric cube. The work around is quite straightforward. 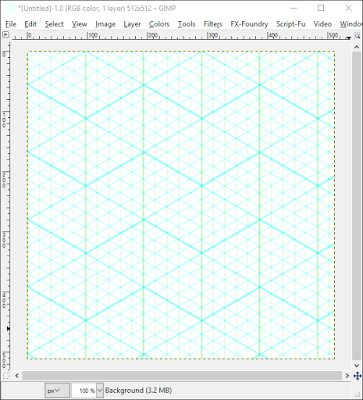 It involves installing two Gimp pattern files that will be used to form isometric grids, and then installing a plugin that will allow you to scale the isometric grids to suit your project. Credit for the pattern scale plugin that we use here must go to Rob A who created it. If you would like to find out more about this plugin there is a description and another download link on the Gimp Plugin Registry. The two images above show what we'll be installing to create the isometric grid patterns. 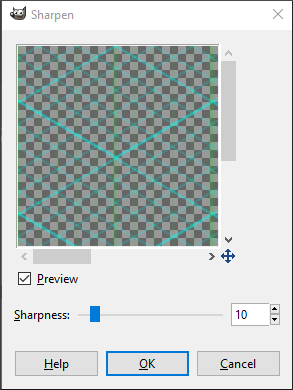 1/ Firstly download this zipped file containing the Gimp pattern files and the pattern scale plugin by clicking the arrow to the top right of the download page. The file is stored on Google Drive so you can be sure it doesn't contain anything nasty. Once downloaded unzip the file. If you don't have software that can unzip files try 7zip. Its open scource and a very handy, reliable app. 2/ Open the file you've just unzipped then click the first pattern file, hold down Shift then click the second file so both pattern files are selected. 3/ Right click then from the drop down menu select Copy. 5/ If Gimp is open hit the refresh button to the bottom of the patterns panel, or restart Gimp and the pattern files should be visible. The images are highlighted above. 6/ To instal the pattern scale plugin go to the downloaded folder, right click on the plugin and select Copy. 8/ Restart Gimp for the plugin to work. 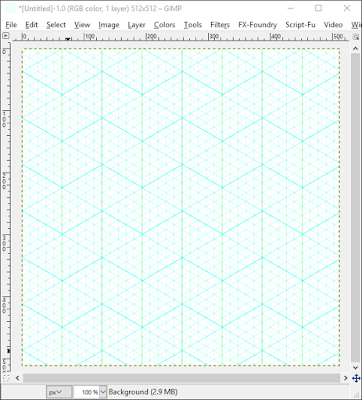 You are now ready to create isometric images in Gimp. Creating an isometric grid is simple. 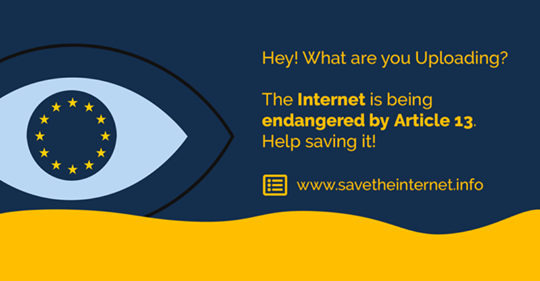 2/ Create the image size. Now create a transparent layer. 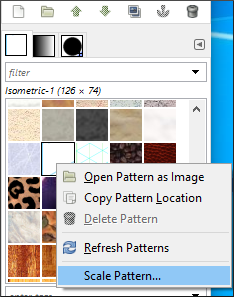 3/ From the pattern tab in the layers panel drag one of the isometric patterns to the image window. You now have an isometric grid. The first isometric grid is shown above. 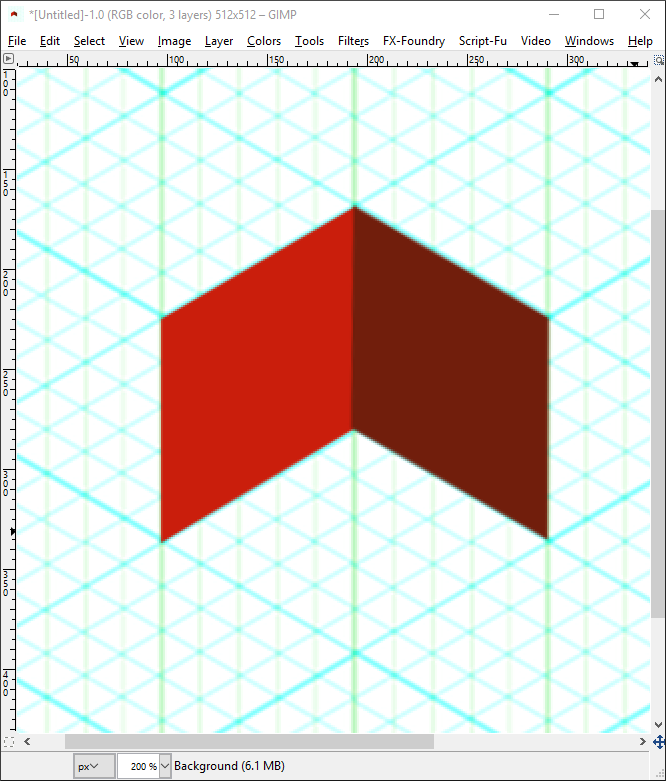 And this is the second isometric grid. As you can see its more detailed than the first. To scale either of the grids follow these steps. 1/ Open Gimp and create the image window size as above, then create the transparent layer. 2/ Right click on the grid pattern you want to use and a drop down menu as shown above will appear. Select Scale Pattern. 3/ The above window will appear. The slider to the top will allow you to scale the grid to anything from 100% to 500%. 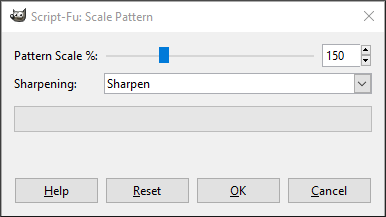 The window below the slider gives the option to sharpen the grids' appearance. Hit OK when ready. 4/ This window will now open. 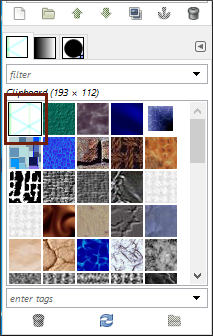 It allows you to select how much you want the grid sharpened by. Click OK when you're happy with the selection. 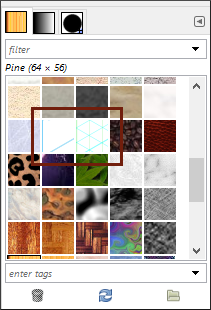 5/ The scaled grid will now appear under the patterns tab, highlighted above. 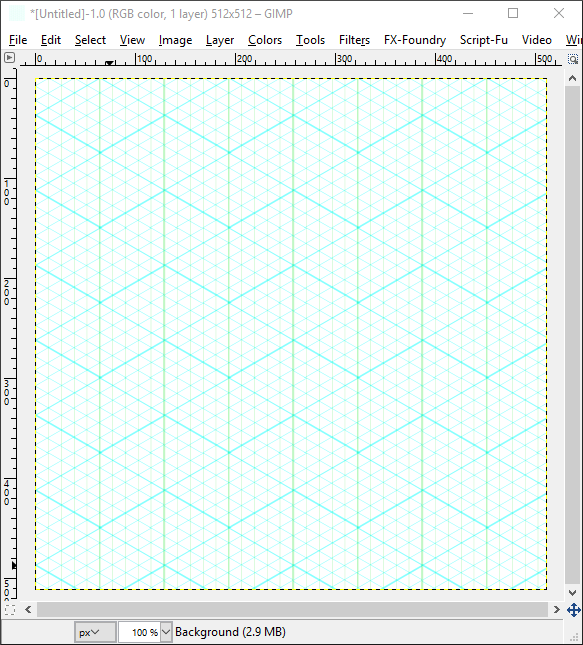 6/ To use the scaled grid drag it from the pattern tab to the Gimp image window. 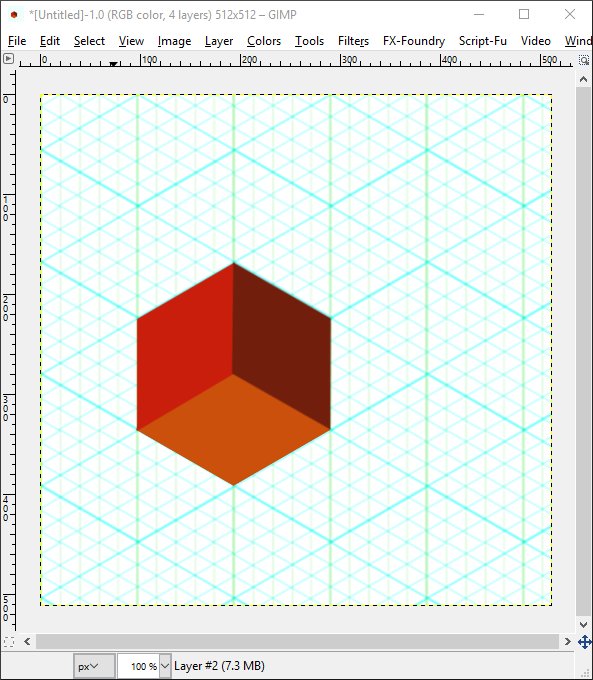 Creating an isometric cube is the basis for most isometric images, and the following steps will show how to do this. 1/ Create a transparent layer for the first side of the cube. 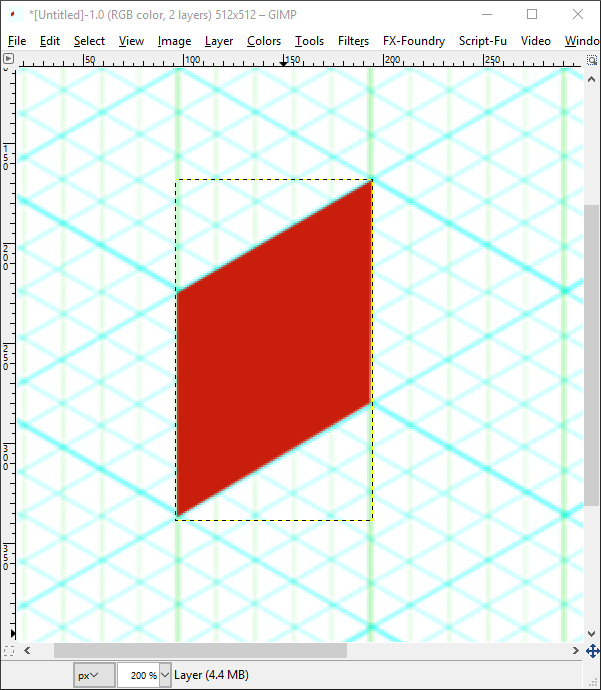 Then with the Rectangle Select tool, drag out a rectangle roughly the width and height of the cube side. 2/ Select the bucket fill tool and click inside the rectangle to fill with colour. Then hit Select > None. 3/ Now select Layer > Autocrop Layer, which will make the layer easier to work with. 4/ From the tools panel select the perspective tool, and the window above will open. A dotted outline around the shape we just created will appear. Drag the Perspective window to one side as we need to work with our shape. 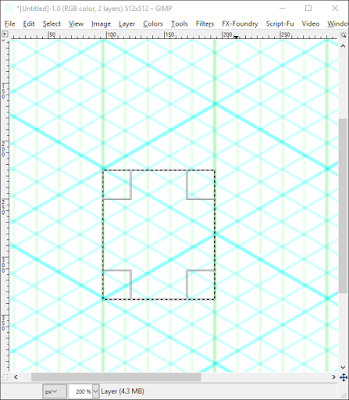 5/ Grab a corner of the dotted outline and drag it so our shape matches points on the grid. The idea is to get the coloured rectangle we created to form a cube side, as in the image above. This is much easier to do if you hit View > Zoom > Zoom in as it allows for greater accuracy. 6/ If you need to you can again position the corners of the shape by repeating the above step. 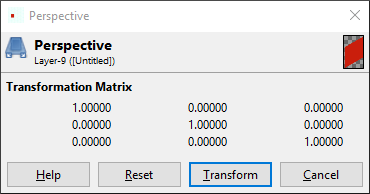 When you're ready click Transform in the Perspective window. 7/ Follow steps 1-6 above to create the second side of the cube. 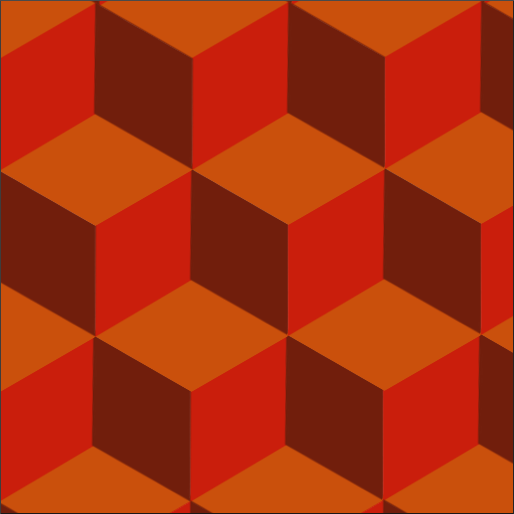 Using a different colour helps to form the illusion of depth to the isometric cube. 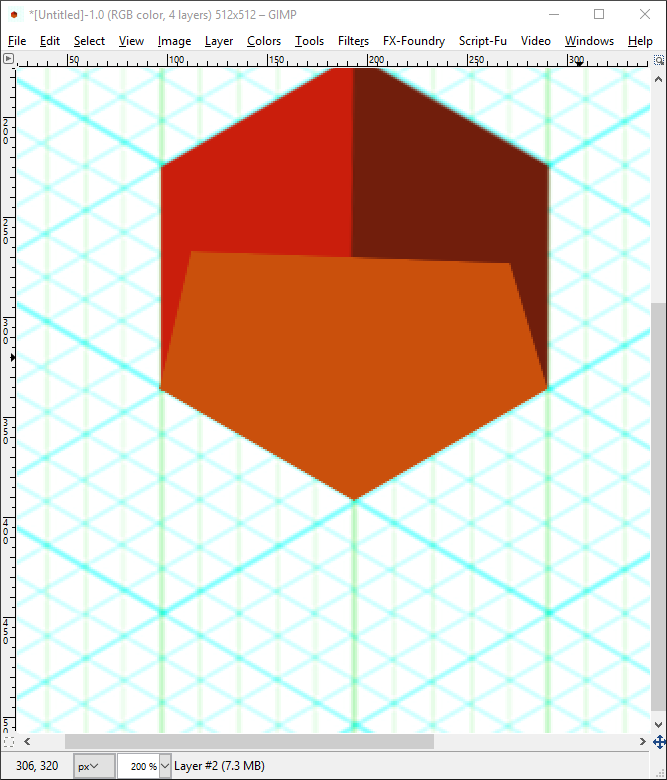 8/ To create the bottom of the cube we'll use the Paths tool, highlighted in the Toobox panel, above. 9/ Create a new layer for the cube bottom. 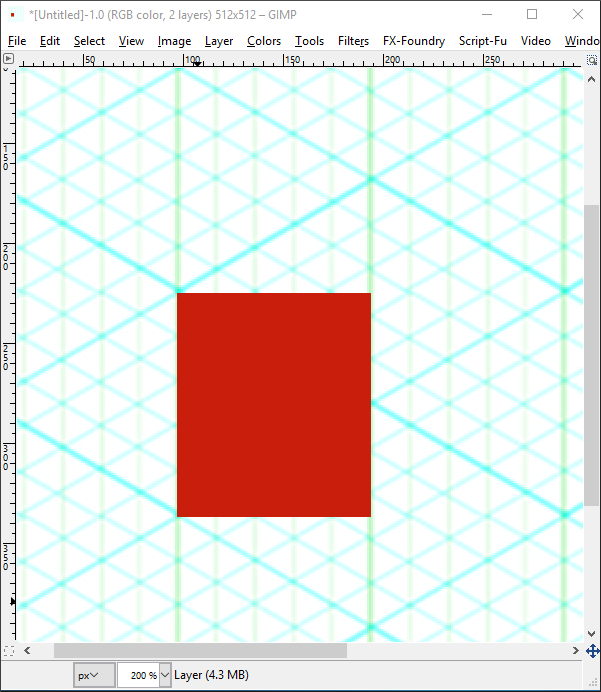 Using the grid as a guide, with the Paths tool create a shape that will form the cube face. At each corner of the shape click to change direction (which will create an anchor for the path). The last click should close the shape. We don't need to be accurate with the sides that meet the other two cube faces, so long as the shape overlaps them (see the image below). Once the shape is created with the Paths tool, you can go back and reposition the path anchors by dragging them. Again zooming in will give more accuracy. 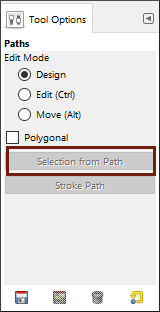 10/ With the Paths tool still selected hit Selection from Path in the lower part of the Tools panel. The shape you created will now have a 'marching ants' outline. 11/ Use the Bucket Fill tool to fill the path. 12/ Move the bottom of the cube layer below the sides layers and you have created an isometric cube. 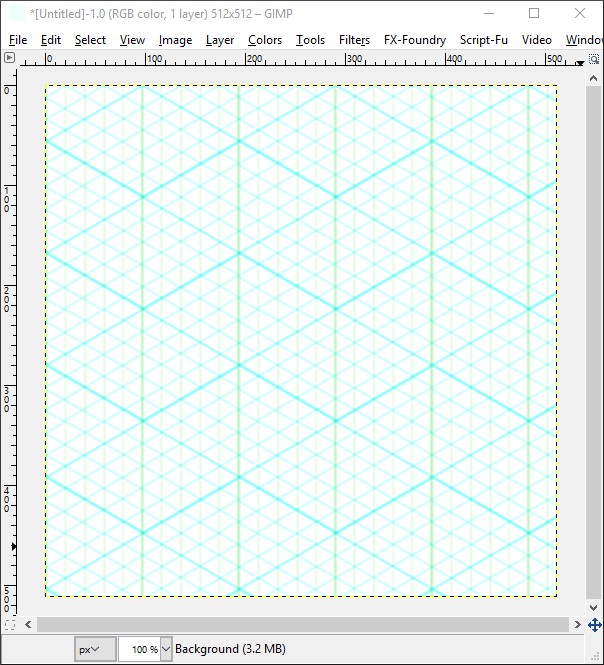 Once the pattern files and plugin are installed creating isometric images and designs becomes very straightfoward in Gimp. If there's one drawback its that the isometric grid has no 'snap to function', but this is easily compensated for by using the zoom in function. Enjoy using Gimp to create your own isometric designs and illustrations. Below is a video version of this tutorial. if you prefer you can watch it here on YouTube.